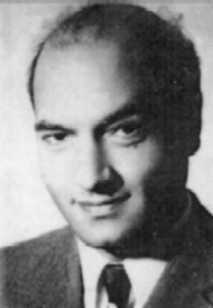 Ali Shariati Mazinani (1933-1977) (Persian: علی شريعتی مزینانی) or Shariati was an Iranian Muslim philosopher, sociologist, poet and writer. Shariati was born in 1933 in Mazinan, Iran. He studied sociology in the University of Paris. He returned to Iran in 1964. When he returned to Iran, the Shah regime arrested and imprisoned him for political reasons. He was released in 1965. Shariati began teaching at the University of Mashhad. He began lecturing at the Hosseiniye Ershad institute in 1967. The Shah regime arrested him again. When he was freed in 1975, he was not allowed to teach or publish anything. Shariati decided to leave the country for England. Three weeks later he died in Southampton under suspicious circumstances. He was buried in Damascus, Syria. Man and Islam - see chapter "Modern Man and His Prisons"
This page was last changed on 20 April 2017, at 13:57.